5-in-1 multi-tool opens cans without creating sharp edges. Why can't I buy this at Vat19? *Note: The product details shown on Vat19 may vary from what is available at the store(s) above. The Auto Safety Master Opener is an amazing 5-in-1 can opener. The cornerstone of this multi-tool is Kuhn Rikon's patented LidLifter technology, which makes opening cans far easier and safer than with traditional openers. The self-attaching LidLifter cuts the outside rim of the can and not the top, which means no sharp or jagged edges are left behind! Use the mini-pliers to lift off the top without ever touching the can. The Auto Safety Master Opener can also open flip tops, screw tops, pull tabs, and break the vacuum seal of screw jar tops. Available in multiple colors. Dimensions: 8.75" x 2.75" x 2.5"
Step 1: Line up the indentations on the side of the Auto Safety Master Opener with the rim of the can. Using the Auto Safety Master Opener's LidLifter is easy. 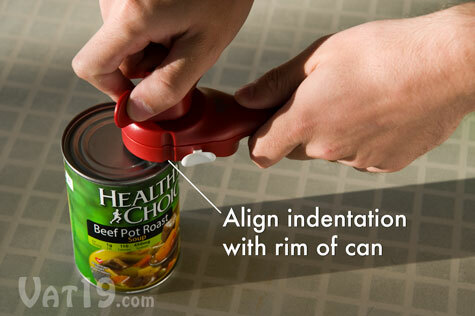 Just align the indentation on the opener with the rim of the can. Step 2: Once lined up, twist the knob clockwise and the LidLifter will automatically grip the lid and begin to cut. 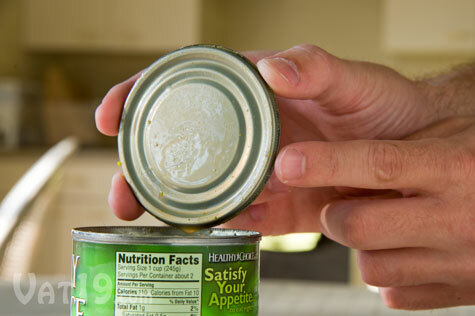 A small ribbed pattern will appear on the rim of the can as the Auto Safety Master Opener performs its magic. As you twist the knob, the opener will automatically grip the lid and begin to cut. 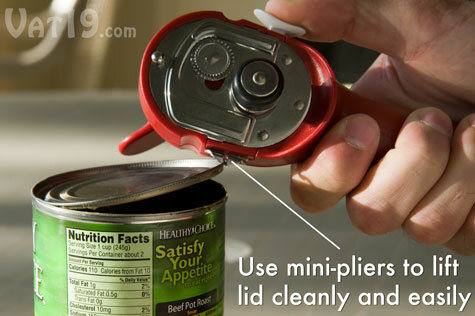 Step 3: Use the mini-pliers to remove the top of the can without even having to touch it! Press the thumb button to operate the mini-pliers. They allow you to lift the lid cleanly and easily. The LidLifter safely cuts the outside rim of the can, not the top. 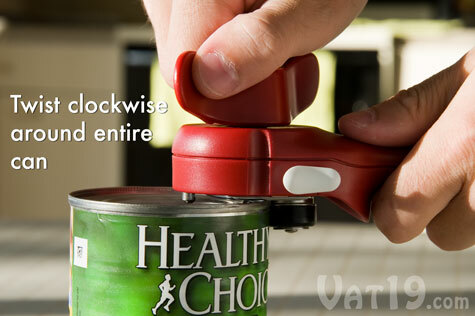 This means smooth and safe edges on both the can and the lid. No longer will your opened-can-tops resemble ninja's frisbees. The Auto Safety Master Opener easily opens the can without leaving behind any sharp or jagged edges. Brilliant! Opens all sorts of other bottles and jars! 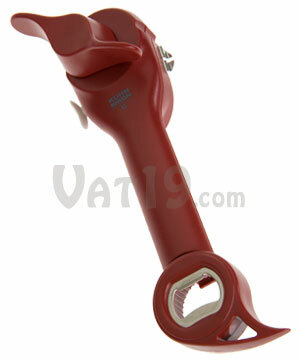 The Auto Safety Master Opener can open many other items in the kitchen. 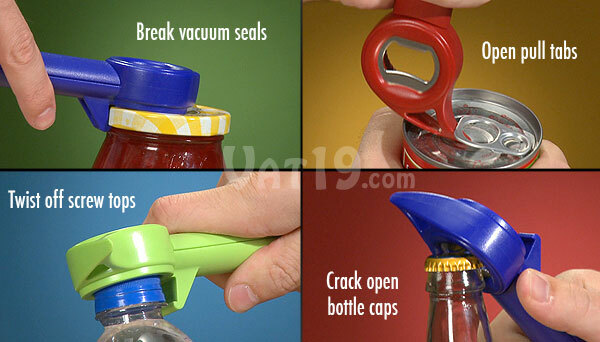 It can break vacuum seals on screw top jars, open pull tabs, twist off bottle tops, and crack open bottle caps. twist off screw tops, and crack open soda and beer bottles. Purchase the Auto Safety Master Can Opener in red, green, and blue. Where can I buy this awesomeness? This product is no longer available for purchase directly from Vat19. Therefore, we are no longer accepting new burning questions at this time. Sorry! Spray fresh citrus juice directly from your fruit. App-enabled scale helps you make perfect smoothies and more. Make healthy homemade potato chips in minutes.